The production program of the TAJMAC-ZPS is composed of high-performance machining centres, Swiss-type Lathes and multispindle automatic machines. All these machines found their usage in the most demanding industrial branches on all markets of the world and gained a very good reputation for their high-level technical parameters, accuracy and reliability. The vertical machining centres are high-performance machines intended for complex chip machining. They are suitable for tool shops, for power machining and when equipped with a pallet changer, they also find their employment in the automotive industry. The work table, whose upper surface serves for workpiece clamping, is traveling in the longitudinal direction (X-axis) along guide-ways of the cross saddle. The cross saddle is moving along guide-ways of the base in the transverse direction (Y-axis). The spindle head moves in the vertical direction (Z-axis) along the guide-ways of the column. All guide-ways are formed by linear guides with rollers. Optionally, it is possible to equip the machines with the 4th of 5th CNC axis and with a wide range of other technological optional equipment. The horizontal milling centres are equipped with a pallet changer with two pallets and a tool changer with automatic tool change function. The machines are intended for productive and complex machining of moulds, dies and workpieces of a flat or box shape made of steel, cast iron and light metal alloys clamped on the work table. They are suitable for mass production. They enable milling operations in three mutually perpendicular coordinate axes X, Y and Z. The rotary table (B-axis) enables machining from several sides. The gantry-type machining centres are highly productive machines with wide range of application when machining complicated spatial shapes in three or five axes. Due to high dynamics, very high rigidity and damping characteristics of the machine structure, they enable utilization of HSC technologies advantages. The gantry-type machines have their spindle mounted in a motor spindle unit built-in in the sliding ram. All movements of the machine are realized by linear guide-ways with rollers. Measuring of position in the X, Y and Z axes is carried out directly by absolute measuring units. The multipurpose machining centres of upper gantry-type enable complex machining of spatially complicated and technologically demanding workpieces as well as of combined shapes, both within five-axis milling operations and full-featured turning operations. The find their use not only in the branches of classical engineering but also in the automotive, plastics and pressing industry. Thanks to their ability to machine in up to six axes with simultaneous possibility of turning, they find their use in demanding areas of engineering and aviation. Traditional concept of cam-controlled turning lathes for large-lot and mass production. The basic configuration is with 6 or 8 spindles, with controlled motors of spindle drives and feeds. Fully CNC controlled machines in 5, 6 and 8 spindles configuration. Suitable for serial production of technologically highly demanding workpieces. We introduce a highly productive Swiss-type Lathes for manufacturing of round bars up to diameter of 32 mm (36 mm) as well as square and hexagon bars. 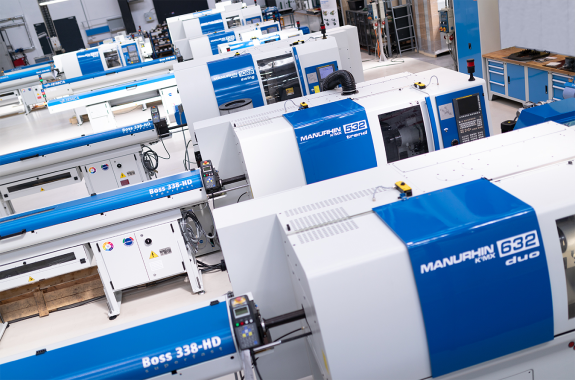 These automatic lathes with sliding headstock expanded the production program of TAJMAC-ZPS a. s. after MANURHIN K’MX acquisition in 2004 and transfer of production from French Mulhouse into the city of Zlín. The MCFV 1060 vertical machining centre covers the whole scale of technologies from the power up to the high-speed machining. The MCFV 1260 vertical machining centre is a highly productive machine for the complex chip machining in the X, Y, Z axes. The MCFV 1680 vertical machining centre is a highly productive machine for the complex chip machining. The MCFV 2080 vertical machining centre is a highly productive machine for the complex chip machining. The horizontal machining centre in the H 500 version is a highly productive machine for the complex chip machining of parts from the steel, grey cast iron and soft metal alloys clamped on the rotary table. The H 630 is a horizontal milling centre equipped with pallet changer with two pallets and with tool magazine with automatic tool changing. The H 800 production horizontal machining centre is utilizable for the whole range of technologies from the power up to the high-speed machining. MCV 1210 is a highly productive machine with a wide range of utilization when machining complicated spatial shapes in three or five axes. MCV 1220 is a vertical milling centre of upper gantry type with two separate removable tables or one fixed and one rotary table in a common or divided working space. The MCV 2318 gantry-type machining centre is, thanks to its parameters, predetermined not only for machining of spatial workpieces of complicated shapes in the branches of classical engineering but also in the automotive, plastics and pressing industry. It enables machining up to six axes. The MCG 1000 5XT machine is a multifunctional machining centre of upper gantry-type designed for complex machining of spatially complicated and technologically demanding workpieces as well as of combined shapes, both within five-axis milling operations and full-featured turning operations. The MCV 2318 gantry-type machining centre is, thanks to its parameters, predetermined not only for machining of spatial workpieces of complicated shapes in the branches of classical engineering but also in the automotive, plastics and pressing industry. It enables machining up to six axes with simultaneous possibility of turning. Basic configuration with 6 transversal, 6 longitudinal saddles and 4 cross saddles. Siemens Simodrive motors with continuous regulation. Possibility of machine modification for spindles stop - the 620SAC configuration. Basic configuration with 6 transversal, 6 longitudinal saddles and 4 cross saddles. Siemens Simodrive motors with continuous regulation. Possibility of machine modification for machining of 42 mm maximal diameter - the 642AC configuration. Both models can be modified for spindles stop - the 632SAC and 642SAC configuration. Basic configuration with 6 transversal, 6 longitudinal saddles and 4 cross saddles. Siemens Simodrive motors with continuous regulation. Possibility of machine modification for machining of 67 mm diameters - the 667AC configuration. The 657AC model can be modified for spindles stop - the 657SAC configuration. Basic configuration with 8 transversal, 8 longitudinal saddles and 4 cross saddles. Siemens Simodrive motors with continuous regulation. Possibility of machine modification for machining of 42 mm maximal diameter - the 842AC configuration. Both models can be modified for spindles stop - the 832SAC and 842SAC configuration. Basic configuration with 5 cross saddles, 6 longitudinal saddles and 1 parting-off slide. Up to 44 numerically controlled axes, independent speeds of the spindles. Siemens Sinumerik 840D sl control system, Simodrive motors. Basic configuration with 7 cross saddles, 8 longitudinal saddles and 1 parting-off slide. Up to 56 numerically controlled axes, independent speeds of the spindles. Siemens Sinumerik 840D sl control system, Simodrive motors. Basic configuration with 7 cross saddles, 8 longitudinal saddles and 1 parting-off slide. Up to 62 numerically controlled axes, independent speeds of the spindles. Siemens Sinumerik 840D sl control system, Simodrive motors. Excellent for long drilling ! Two tools together on main spindle! Most powerful swiss automatic lathe! THE MANURHIN K’MX 816 CLEVER is designed for the productive machining of parts for bars of a maximum diameter of either 16mm or 20mm. The MANURHIN K’MX 916 CLEVER is designed for the productive machining of parts for bars of a maximum diameter of either 16mm or 20mm. The MANURHIN K’MX SWING we deliver in version 1026 for Ø 26 mm bars or 1032 for Ø 32 mm bars (bar end adjustment is needed). - AUTOGYRO gyroplanes from Nirvana Systems s.r.o., air school FLYWAY s.r.o. You can register via our registration form.